Then there was the time we were doing a project at a prestigious New England college that will remain nameless. For many, many years this college was all shaded with elm trees. Then the elm trees died and the college looked like a prison. So what they did, instead of planting just one or two kinds of trees as a replacement, they planted all different kinds of trees. They basically turned the campus into an arboretum, with one kind or another of special and unique tree everywhere you look. We were emptying furniture from a bunch of dormitories, thirteen tractor-trailers in all. Long trailers, 53-footers, with long overnight cabs. So every time a trailer arrived, I ran out to guide it in, to make sure it didn’t knock into a tree. God forbid we should break a branch, dislocate a leave, tweak a trunk, blemish some bark, ravage a root. Twelve times I did this. Twelve trailers backed in without more than gently caressing a leaf or two. Then, of course, lucky thirteen. This guy called and told me where he was, so I ran across campus to bring him in. But when I was running that way, he decided to drive this way, find the dormitory on his own. Which he did, the jerk, and backed his truck right up to the back door, the jerk, right through half of a Zincus speciallas or a Quincus uncommonus or a Flunculus exceptionalis, or whatever the damn rare tree was. The jerk. So I got back huffing and puffing from not finding the guy, and found the guy with his truck, and a great big branch of some rare, exotic, and irreplaceable tree lying next to it. There was no way to hide the branch, so we did the next best thing. Tossed it in the nose of the trailer and packed furniture over it as fast as we could. Who knows, maybe it went back to the foreign country it came from in the first place. Then there was this other arboretum campus, which will also remain nameless. We did a project there that was a combination of trailers for usable furniture and rolloff containers for scrap metal. I did not know this before hand, but there is a thing around fancy trees called a drip line. If the sun was directly over the tree, the drip line is the tree’s shadow. 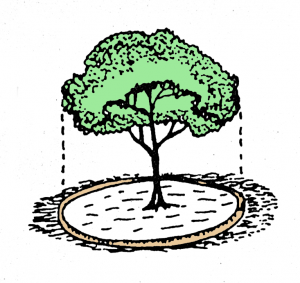 Or put another way, if rain falls within the drip line, it has to hit the tree before it hits the ground, because there is a leaf in the way. 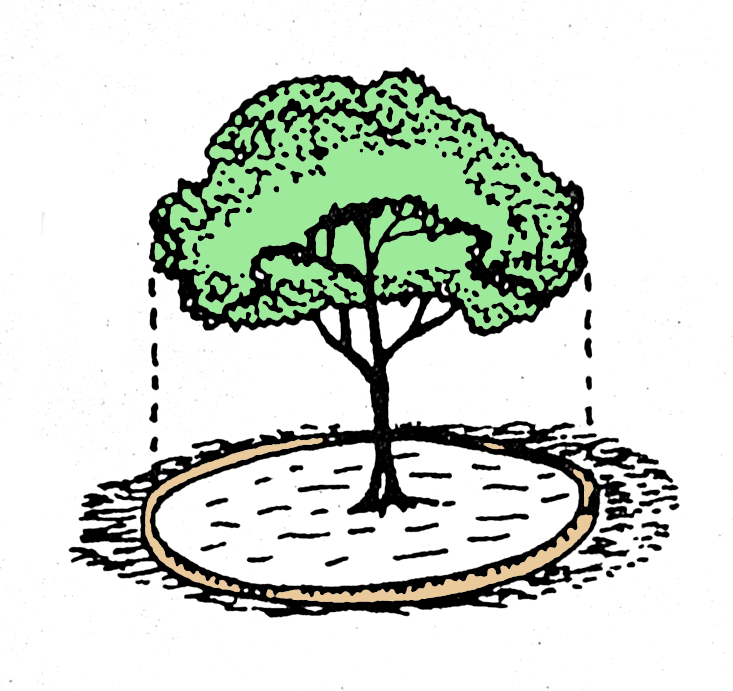 Now the deal with this campus was that you could not park a vehicle or even drive a vehicle inside the drip line of any tree, lest you compact the soil, decrease its permeability, and interfere with the tree’s hydration. Which is a fine thing for the trees, I guess, but is not such a fine thing if you are trying to get tractor trailers and rolloff containers close to a bunch of buildings, and the buildings are surrounded by trees, and you have three days to remove 1,500 pieces of furniture from dormitories that do not have elevators. Personally, I was sort of the supervisor so it did not affect me directly. But the kids on the crew, who had to push this furniture in some cases 150 feet instead of 25, they suggested that a few minutes with a chain saw could make the drip lines much, much easier to deal with. 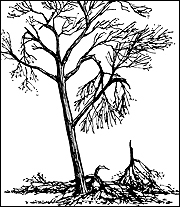 By the way, If you are not from the northeast, here is what happened to the elm trees. 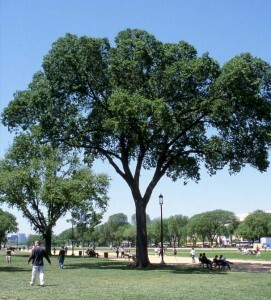 Elm trees are actually sort of a weed that normally grows in and around swamps. But planted by themselves they grow very large with a very aesthetic sort of upside down vase shape, and so New Englanders planted them everywhere. Every college campus in New England was covered with elm trees. Then a fungus or a parasite, I forget which, came over from Holland on a boat and caused something caused Dutch Elm Disease, which killed all the elm trees. So for a time in the 60s and 70s nearly every college campus in New England looked pretty much like a prison. Most of the trees they planted as replacements were sugar maples, and now the sugar maples are stressed by climate change and they may go away, too.